Whether your staff spends their work day working on a computer screen; behind the wheel of a vehicle, or on site with a client… once they’ve experienced a day of working with coworkers to accomplish seemingly-impossible tasks, they’ll never look at their own role quite the same. 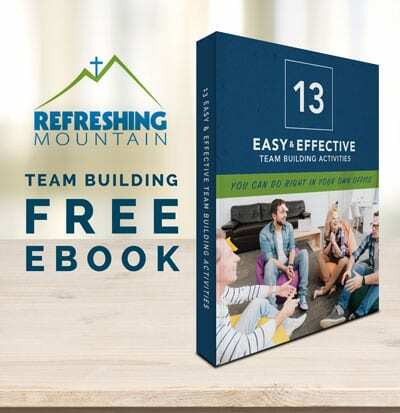 Here’s an introduction to 4 problem solving and team building ideas you can do at Refreshing Mountain. Each activity will enable your employees to experience firsthand not only how well they communicate, but also uncover the impact of their behavior and communication on the team’s performance. Though it only has 5 rungs to climb before you and your partner arrive at the top, team building activities on the Giant Ladder come with a caveat. For this challenge, the ladder has rungs strategically situated 3 to 5 feet apart! In addition, it’s a free-swinging ladder, making the challenge even harder. The higher you climb, the more difficult it gets and the more you have to rely on your climbing partner. It’s a fun way to start activities and to prepare for the more complicated team exercises to come. Ascending to the top of the corporate ladder was never this much fun! Physically experiencing what it’s like to suddenly, and unexpectedly, have more and more people involved in a conversation or situation, sheds a light on how adding new members (voices, opinions, experiences, talents etc) affects the team. Members of a group need to “join the conversation”, one by one by stepping onto a giant wooden see-saw platform. The trick is to mindfully join so everyone involved… doesn’t lose their balance. If members haphazardly hop onto the moving platform before accessing the situation properly, the platform will tip and everyone will be negatively affected. In addition, the “Gossip Table” begins to challenge individuals to let go of the need to control the situation, conversation, or activity. When someone moves, all members must quickly (yet purposefully and collaboratively) find a way to stay balanced so no one is “lost”. 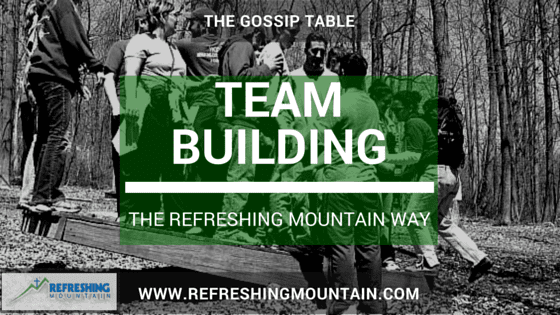 Although team building activities like the “Gossip Table” are impossible to do without collaboration, each individual member of that team plays an integral role. 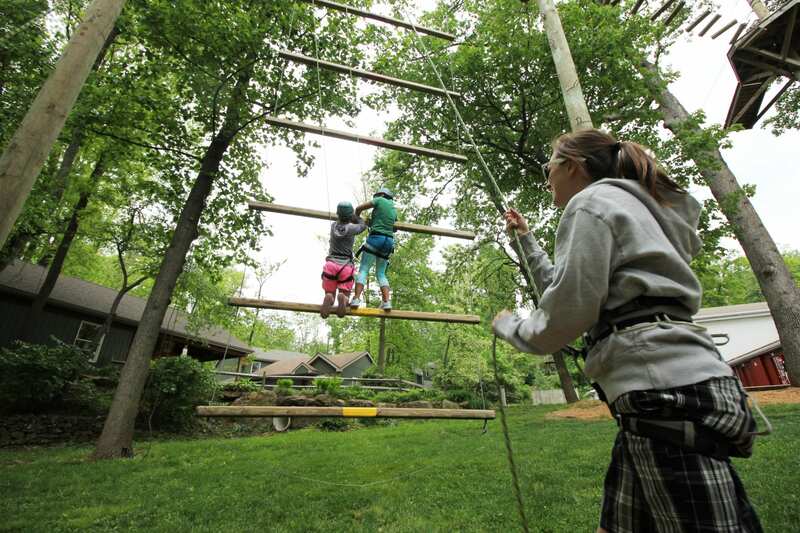 Encompassing 4 phases of climbing and team build activities… each more difficult than the previous, the 34-foot climbing tower brings forth lots of great outcomes for individuals and teams. While four people can climb simultaneously, it’s not a race to the top. For those with climbing experience or who simply aren’t afraid to approach the activity, they instantly and naturally become teachers, motivators, and inspirational leaders. The exercise continues until the last individual scales the climb… so leaders must come alongside those experiencing anxiety. The climbing tower is an exceptional team building activity for many reasons, but ultimately it’s a physically and mentally challenging exercise that bonds coworkers as they strive to achieve common goals. This activity may be done late in the evening since overhead lights are installed on the wall. Climbing activities are accessible until 11:00 p.m. If you are looking for more than 1 or 2 outdoor team building activities, consider the High Adventure Challenge. Incorporating multiple high ropes obstacles (some similar to those on the popular American Ninja Warrior show, although not quite as challenging) with the fun and exhilaration of ziplining, this adventure course challenges employees to work together while building personal confidence, facing uncertainty, and improving communication skills. After climbing stairs and zip lining, you’ll be 35 to 45 feet in the air. Prepare to work your way across a cargo net, balance on a wobbly log, and swing on vines to get to the next adventure. If the activity gets a bit “challenging” for an individual, they can take a breather by walking across a cool 70 foot “cat walk” bridge. After a morning, afternoon or weekend of team building activities, your staff will surely feel inspired and rejuvenated… refreshed even! Expect them to possess a healthy reminder of how individuals comprise an integral part of the whole. The activities described above are just a selection of the many activities we offer for team building events. We offer a number of half day and full day packages and our experience staff can work with you to develop a custom package that fits your budget, group dynamics and desired outcomes. Show how much you appreciate your staff ~ give them the opportunity to connect and excel through our one of a kind, Refreshing Mountain team building activities.